205 million internet non-users are likely to go digital if internet is provided in a language of their choice, according to the report titled “Internet in Indic 2017”, published jointly by the Internet and Mobile Association of India (IAMAI) & Kantar IMRB. The report estimates 335 million out of 481 million internet users in India are non-unique users of internet in Indic, out of which 193 million are non-unique users from urban India (58%) and 141 million non-unique users from rural India (42%). The term non-unique refers to the fact that these users do not access internet only in Indic; but only a small proportion of their usage is in Indic. 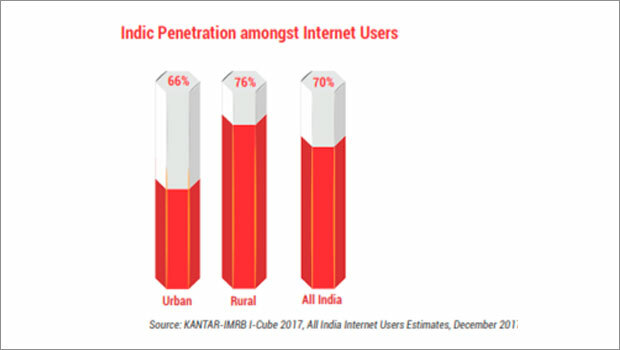 According to the findings of the report, a relatively higher proportion of Indic content consumption can be observed in rural India (76%) while in urban India over 66% of the internet users access internet in Indic. Indic content consumption is higher in socio-economically weaker sections, as is evident from the fact that both in urban and rural India, SEC D/E have around 80% users accessing Indic content. The findings suggest that age is a significant factor determining the Indic consumption over internet. Survey suggests that 75% of users over 45 years of age in urban India and 85% of users over the age of 45 years in rural India access internet in Indic. The report also finds that usage of Indic in urban India is strictly restricted to various forms of entertainment like music/ video streaming news and other forms of entertainment. On an average, 70% of total usage of internet in Indic is restricted to such activities. In comparison, critical services like online banking, job search or ticket booking (which is the most popular e-commerce activity in India) still reflects very low local content usage (less than 20%). Even access of a search engine, which is often the first port of call for most internet users, is only 39% in Indic. According to IAMAI, this reflects the restrictions of access of such critical internet services in Indic, which in turn is limiting internet penetration in rural India and among the economically weaker sections. The survey also reveals that internet in Indic will be a key motivator for 23% of internet non-users to go digital. This in effect suggests estimated 205 million new internet users would come online if internet content in Indic is promoted in India. IAMAI would like to highlight that Internet in Indic is not limited to content in Indic but in effect refers to the entire digital ecosystem. Going forward, URLs, domain names, key tags, indexing etc., have to be promoted in Indic to make the entire digital interface user friendly. Globally, China has managed to achieve the highest number of internet users by using Mandarin script for internet content, so much so that Chinese is the second most popular language on the internet after English. In contrast, Indic content accounts for barely 0.1% of the worldwide internet content. Established in 2004, IAMAI has been addressing the challenges faced by the digital and online industry including online publishing, mobile advertising, online advertising, ecommerce, mobile content and services, mobile and digital payments, and emerging sectors such as fin-tech, edu-tech and health-tech, among others.